LANTANA DESINER 3 bedroom, 2 bath home exactly where you want to be! Close to LAKE SUMTER LANDING and BROWNWOOD PADDOCK SQUARES in the Village of Poinciana. GOLF FRONT! Drive up the beautiful paver driveway and enter through the lovely glass front door. Tile through the whole main living area. Nice carpet in the bedrooms. UNIQUELY DESIGNED FLOOR PLAN allows large usable space for the living room. GRANITE COUNTERS BRAND NEW KITCHEN APPLIANCES! Master Suite has vaulted ceiling, CUSTOM MADE CLOSET, Double Corian Vanities and a Walk-In Shower. Guest quarters are tucked away in the front of the home for privacy. Guest bath has a solar tube for natural light. Tiled Shower and Corian Counters. CUSTOM Closets in all Bedrooms. SUMMER KITCHEN on the lanai. There is a GOLF CART GARAGE and the garage has tons of room and is "SHOP READY. There have been extra outlets and lights installed. The garage also has a full electric roll down screen to allow air flow through the whole house. Pull down stairs to the Attic with large floored area. Lightning Rods. 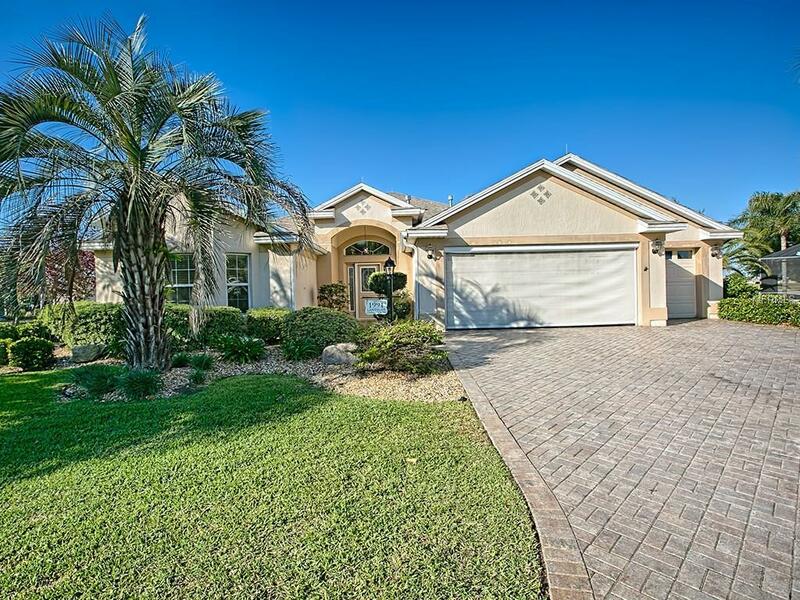 This house is located is such a great part of The Villages with 6 swimming pools within mile radius, Lake Miona Rec. Center and Sea Breeze Rec. Center each about a mile away. Short cart ride or nice walk to Cain Garden Country Club. Pickle ball, Golf, Shuffle Board and Bocce right around the corner! Bond Balance $10,043. BEAUTIFUL!